The FAQ (frequently asked questions) is here to answer common questions about the SWMinis app. Any new questions should be sent to ideas@cherryhilltech.com. What does the gold own button do? This button lets you mark a figure as 'owned'. When a figure is owned, the button turns gold, as does the figure title text. In addition, the figure gets added to the ones on you own on the 'My Collection' screen. This information is not overwritten when the app is updated, so you won't loose it. What are the blue and red flags for? It is up to you. You can also sort figures into buckets using the five star rating system, if you don't wish to use that for actual ratings. How do I remove all stars so a figure has zero stars as the rating? To remove all stars, swipe across the star ratings from right to left. Swipe all the past the leftmost star and it will be turned off too. The figure will now be unrated. Where can I find minifigs to buy to complete my collection? Is the app safe for kids? Yes it is. Apple has guidelines for the new kids section of the app store which does not allow external links, ads, or in-app purchases (unless you use a confusing 'parental gate'). A 'safe for kids' app means it does not link to websites or use social media, does not use in-app purchases, does not ask for or store personal information, and does not have live advertising. Also, the content must also be appropriate for an age group below 12 years old. With the update 1.1.4 in March 2014 this app is safe because it has been altered to fit these requirements, and thus does none of the above. Older versions linked to safe fan minifig websites, as well as our other apps in the app store, but we chose to remove those links in order to list the app in the kid safe section of iTunes. What Does the App Show? If a better one appears for a style it replaces the old/empty accessory. For example, the new brightgreen lightsaber replaces green for Yoda. The only accessory in doubt is the choice to use a lightsaber vs lightning bolts for Palpatine. What happens when the accessories are shown differently within the same set? For set 9490, the Sandtroopers accessories are not consistently depicted between the instructions, box art scene, and box art minifig pic. Thus, a decision was made to defer to the accessory used in the box art minifig pic. Thus the white pauldron Sandtrooper has the longer blaster. How are the figures's named? Ideally we would want to use the official names on the boxes. However, this is not workable. Unfortunately the names given to figures over the years on the set boxes have not been done with the same level of detail. Often the name is omitted. In other cases the same figure is given different names from set to set. This has necessitated using a consistent scheme which is explained here, so that different styles of the same figure have the same name, and so the figures fall into order alphabetically by the most important part of their name. Basically, words have been reordered to preserve alphebtical order, for instance putting all clones starting with the word Clone. Ranks and Position such as Captain or Princess are appended to the end of the name in parentheses to ensure that the alphabetical order is preserved for the base name, which is more important. Thus Princess Leia is listed as Leia (Princess). 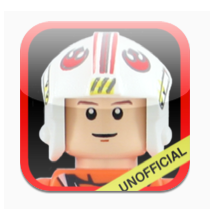 The Lego name is used when mentioned, except when it would alter the alphabetical listing, differs from the box, or is not consistent (as is the case with Clone troopers). If a name appears on the box art minifig pic, then that name is used, and if needed, earlier figs of the same style are renamed. Some names for figures change or evolve. For example, set 9490 began the use of the term 'Sandtrooper'. 6 of the 14 Stormtroopers were thus renamed to Sandtrooper. If a more exact name is used for later versions of the figure, than earlier versions are altered so they all refer to the same figure, for example the Rebel Technician. Likewise if a more generic name is used later, then the earlier exact name is used, for example, R4-P17 rather then Astromech Droid. How are the figures described? Every figure has a lengthy unique description, even if there is only one style. Common English and easy to understand color names and descriptions are used and any mention of a containing set number, name, or the SW universe is avoided as that has nothing to do with the figures visual appearance. Colors and unique markings are described, and the parts or marks that distinguish one style from another are carefully analyzed and made as clear as possible. All descriptions have been revised and improved as newer styles and new figures are added. Many sets later released an alternate fig, and it is labeled as alternate only if it appeared in that set. The rare Leia with smooth hair is a good example of an alternate figure. Correct, they are not minifigures. However, folks wanted to see them and it is a fun thing to add, so here they are! What is the small code in the lower left corner? This is a unique code you can use to keep track of a particular figure. There is no order or logic to these codes, they are random and only found in this app, as we created them, but each figure has its own code. Beginning with the March 2014 update this code will appear in the app, so you could use it to write down a fig by this number to refer to it as well. We needed to come up with or own code since there is no official numbering scheme, or one that both includes all figures, includes the newest figures, and is freely available for all to use. Why add the ability to find a fig via a set? This is the most requested feature from several of you! Keep the emails coming for ideas and corrections! What is the main set and how did you choose that? The main set is the one that, in our opinion, best represents the figure, and is should be also the one that also has the accessory shown to the right of the figure. The main set is the one listed below a figure. If a figure only appears in one set then obviously it is the only one listed as the main set, with a title and a set number. If the figure appears in other sets only the set number is listed for the additional sets in a second row. You can look up more details for a set under the set tab and sort by number, year, or name, to find a particular set. Will set pictures be added? They will never be added as the app size would be unwieldy and the app design is on the minifig collector rather than the set collector. Older set pictures and info can be found at sites such as Brickset.com or Brickowl.com. Newer set pics of course are at the official Lego.com website. Why not quantities of figs for the same set? Figures shown for a set are the unique styles in that set. There could be many battle droids in a set of the same style but only one is shown. Often a set lists an alternate design of the same figure though. Can I mark a set as owned in addition to having the app mark all the figures in it as owned? The app marks a set not as owned, but signifies that you own the figures in this set and colors it as not needed. You might never have bought a set, but have all the figures since they were in other sets. Again, since the app focus is on figures and not sets, there is no need to then get that set if you already have the figures in it. However, all sets now have unique figures so you should plan on getting all sets to have a complete minifigure collection. The plan is to keep the app updated as soon as new figures are released. All pictures are taken from real figures purchased from sets from a Lego store, so they need to first be released in the US. The app is then updated and submitted for review. This process takes a few weeks to do for each update. The iOS7, summer release was especially difficult due to the large number of new sets and figures, and the iOS7 changes to fix problems. The app was actually removed from sale for the first time ever in late September since it was buggy in iOS7, and there were so many figures out of date from the summer release that it was not deemed A+ until updated. How did you take the pictures? That is a sort of a secret, and we have have revised our lighting, setup design, and cameras many times to keep improving them for you so they are consistent, clear, and accurately depict the figures the best that we can. If you think any particular photo is wrong or of poor quality please tell us. We are always going back many years and retaking old photos to fix an error or improve one. What are items that contain minifigs but are not considered sets? Polybags are small models and/or minifigs in a small plastic bag about five inches square. Usually, if a minifig is included, it is the only one in the bag and often is a new figure. Other 'non set' items are official Lego DVDs, books, watches, magnets, clocks, and gear. Rare non set items are more unusual, and can be found at trade shows, theme parks, in-store events, etc., and often have unusual packaging packaging, or no packaging. These types of items are now all grouped in the app into a polybag, book, dvd, and event catchall sets within the set section. These are only included if that was the only way to find that figure. Are references to minifigs that come with the 'non sets' included? Yes, but only if the figure is a unique figure. Why is the real 14k gold C-3PO missing? Anything available is included if possible, except those that are one of a kind, such as the George Lucas figure. What are the most valuable figures in the app? Here are the most valuable figures off the top of my head. There are others too.